Russia's marooned Mars probe Phobos-Grunt, currently stuck in orbit, is headed for a mid-January plunge into Earth's atmosphere, and more than two dozen pieces of the huge spacecraft could survive the fall, scientists say. Current re-entry forecasts have the Phobos-Grunt spacecraft falling Jan. 14 or 15, plus or minus five days, according to space junk expert Heiner Klinkrad. Klinkrad, head of the space debris office at the European Space Agency's space operations center in Darmstadt, Germany, said Russian scientists are hard at work assessing the re-entry survivability of Phobos-Grunt, a spacecraft that tips the scale at nearly 14 tons. "They assume that about 20 to 30 fragments will reach ground with an overall mass of less than 200 kilograms" - some 400 pounds of leftover hardware, he said. Phobos-Grunt launched into space Nov. 8 (Nov. 9 in Moscow), but failed to transfer to an interplanetary trajectory. Its mission was to land on Phobos, one of two moons circling the Red Planet, snare samples and rocket them back to Earth in 2014. A large part of Phobos-Grunt's massive bulk consists of the toxic rocket fuel UDMH, short for unsymmetrical dimethylhydrazine and nitrogen tetroxide. This propellant was reserved for Phobos-Grunt's trip to Mars, and the spacecraft's failure to leave Earth orbit means the fuel is still onboard and could start spilling when the craft is 62 miles from the ground. "The large aluminum propellant tank is likely to start leaking near 100 kilometers altitude, release its UDMH and then largely burn up," Klinkrad told SPACE.com. According to the Russian federal space agency, Roscosmos, the Phobos-Grunt probe is carrying roughly 7.5 metric tons of hydrazine and nitrogen tetroxide. Dealing with loaded tanks of toxic propellant in space has a history. In February 2008, a disabled U.S. National Reconnaissance Office spy satellite was purposely destroyed just prior to re-entry using a modified missile fired from the warship USS Lake Erie. That satellite, USA-193, had a titanium tank carrying roughly 990 pounds (450 kilograms) of frozen hydrazine. The destruction of the spacecraft was authorized due to the potential of the titanium tank to survive re-entry intact, with its contents posing a hazard to people on Earth. If USA-193's tank had been made of a quicker-to-melt material like aluminum, according to re-entry experts, taking out the spysat would not have been necessary. ESA's Klinkrad said assessing the re-entry survivability of Phobos-Grunt is normally left to the spacecraft's owners, "due to their intimate knowledge of the spacecraft geometry, its mass distribution and the materials involved." Pinpointing today when and where any pieces of Phobos-Grunt will land is not possible. 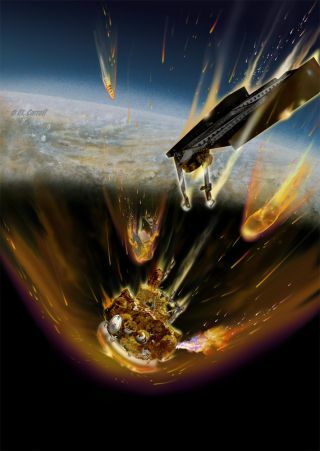 According to NASA's Orbital Debris Program Office, a significant amount of debris does not survive the severe heating that occurs during re-entry. Components that do survive are most likely to fall into the oceans or other bodies of water or onto sparsely populated regions. No serious injury or significant property damage from previous debris re-entries has been confirmed. That's the view of Andrea Gini, founder and editor-in-chief of the newly established Space Safety Magazine, published by the International Association for Advancement of Space Safety and the International Space Safety Foundation. "While a lot is done today to ensure launch safety, safety of operations, space debris tracking and avoidance, the issue of re-entry is generally put on the back burner until it's too late to actually do something about it," Gini told SPACE.com. He said that the matter of falling debris is “too often minimized” by authorities, who consider the risk of debris hitting someone very low, given the distribution of the population and the percentage of the Earth covered by water. "I believe that uncontrolled re-entry is not a matter of risk but a matter of responsibility,” Gini emphasized. "If an accident will happen as a consequence of falling debris, it will damage not only the people or properties involved, but also the public perception of the reliability of the space industry as a whole." The miniaturized Mössbauer Spectrometer aboard the Mars probe Phobos-Grunt was developed by the Institute for Inorganic and Analytical Chemistry at the University of Mainz in Germany. It carries a small amount of radioactive material, cobalt-57. Russia's NPO Lavochkin was the main developer of the wayward interplanetary probe. Lev Zelenyi, director of the Space Research Institute in Moscow and chairman of the Russian Academy of Sciences’ Solar System Exploration Board, wrote in an open letter to Phobos-Grunt colleagues Dec. 8: "Lavochkin Association specialists will continue their attempts to establish connection with the spacecraft and send commands until the very end of its existence. We are working nevertheless on the issue of re-entry and probability of where and which fragments may hit the ground (if any)." Zelenyi noted there is also "a sensitive matter" of the presence of radioactive material, cobalt-57, in one of the scientific instruments aboard Phobos-Grunt. He added, however, that the amount contained in the device is less than 10 micrograms and no significant problems are anticipated. The apparatus containing the cobalt-57 is the miniaturized Mössbauer Spectrometer — MIMOS II — developed by the Institute for Inorganic and Analytical Chemistry at the University of Mainz in Germany. This instrument, a modified version of gear onboard NASA's Mars rovers Spirit and Opportunity, was to examine the chemical composition of rocks on Phobos. MIMOS II is roughly the size of your hand and is mounted on a robotic arm of the landing module that was to plop down on Phobos. The device works by subjecting a sample to gamma radiation and measuring the gamma-rays that are absorbed and re-emitted by the sample. One likely bit of spacecraft hardware that seems certain to survive the fall is the Phobos-Grunt descent space vehicle: the probe’s sample return capsule, which has a thermal protection coating. If all had gone well with the mission, this nose-cone-shaped container would have hauled back to Earth bits of Phobos for detailed scientific analysis. The descent space vehicle was built to survive the heat of re-entry and to fall without parachute into the Sary Shagan missile test range in Kazakhstan. This capsule contains the Living Interplanetary Flight Experiment (LIFE) designed and built by the Planetary Society, apublic space organization headquartered in Pasadena, Calif. The LIFE bio-module experiment is inside the sample return capsule, a short cylinder that looks much like a hockey puck, but smaller. According to the Planetary Society’s website, LIFE was devised to assess whether organisms can survive for years in deep space. LIFE carries selected organisms to "test one aspect of transpermia, the hypothesis that life could survive space travel if protected inside rocks blasted by impact off one planet to land on another." The microbes selected and carried by LIFE are not dangerous to humans, the website added.